Four small scale magicians/illusionists each finish their individual performances, when they're mysteriously left a tarot card by a hooded figure, leading them to an address. Together, they break into the flat, and we cut to a year in the future, where our four magicians are now performing in a large venue, using an audience member to steal millions of dollars from a bank on the other side of the world, in less than a minute. This, naturally, sparks up investigations of all sorts, as the newly named Four Horsemen continue their plan. On paper, Now You See Me is a good idea. Films centred around magic don't come about all too often, and personally I find it refreshing when one surfaces. For example, Christopher Nolan's 2006 film The Prestige makes for a fantastic dark thriller based solely around the competition of two magicians. Now You See Me, however, is far from the same league. Here, director Louis Leterrier has opted for a much more fun approach to cinematic magic, and the results aren't all bad. Where the film succeeds, it really manages to impress. The comedy here is great, and the actors all have visibly strong chemistry with each other. Isla Fisher, in particular, I found brilliantly cast, with some truly exceptional one liners. The constant element of fun is present from beginning to end. The film even begins with a magic trick aimed at both characters and the audience itself; it engages with us from the offset. Even when the film slips slightly into conventional action territory, it's simply thrilling to watch. However, it really comes into stride when magic master Thaddeus Bradley (Morgan Freeman) explains to other characters (and in some respects, also to the audience) the ways in which the magicians have completed their tricks. There are some brilliant "aahhhh" moments when little cogs and gears slot into place in our minds. Consider this to be a two-hour episode of Hustle. However, the film is not without its flaws, and unfortunately, there are quite a few of them. Character development here is catastrophically weak. By the time the credits roll, 120 minutes after we meet the characters, we know hardly any more about them than we did at the beginning. But, the characters themselves could be so interesting, that's the frustrating thing here. More of their brilliant chemistry would have allowed us to care more whether they succeed or fail. But here lies another flaw. It's hard to find a point in the film where you have any slight doubt that they will succeed; there is no element of danger. Understandably, Leterrier focused on the element of fun, but a little bit of danger or threat wouldn't have gone a miss. It's also difficult to find a film so mind-numbingly tacky as this in the past decade. The mysterious hooded figure, the mildly appropriate tarot cards, even a so-obviously-coming-you'd-have-to-be-blind-to-not-see-it-coming "surprise" romance blossoming between two characters. There were moments when the whole screening room audibly cringed and groaned at what they were witnessing. It becomes quite painful. There are also numerous errors in the film's production. For example, an intentionally dramatic close up of two characters holding hands, yet in the next shot they aren't. Mistakes like that should've been picked up in the editing process. But, the film's main problem lies with it's ending. It just doesn't make sense, and practically spoils the previous 100 minutes. I could never watch the film again, just knowing what's coming in the final scenes. Overall, there is more bad here than there is good. But I just couldn't help but enjoy the film. There hasn't been anything like this out in a long while, and it was refreshing to see something legitimately original come to life in front of you. Undeniably, there is a lot wrong with it, and the ending may leave you regretting the previous 120 minutes of your film, but enjoy the first two acts while they last, because they are, simply put, brilliant fun. 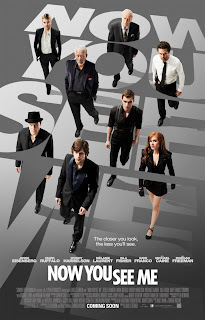 To Summarise: Whilst badly suffering from poorly developed characters and a thoughtless ending, "Now You See Me" is ultimately an original, and somewhat satisfying modern crime film.